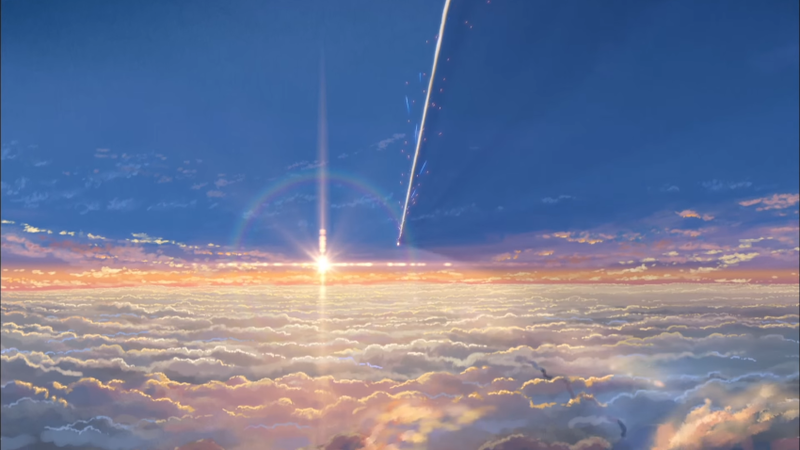 Your Name is the new animated film by director Makoto Shinkai. For some readers, the story of a Tokyo boy, a country girl, and what happens when they start to swap lives, will be their first taste of Shinkai – all Shinkai’s films are self-contained, and can be enjoyed in any order. Other viewers will have seen his films over the last ten years, such as 5 Centimeters Per Second (2007), Journey to Agartha (2011) and The Garden of Words (2013). Other fans have followed Shinkai for longer still. Many directors, and certainly many anime directors, spend their early creative years in obscurity, climbing the credits of other people’s productions, or making tiny films for tiny audiences. Shinkai is an exception. From almost the start of his anime career, he’s had a substantial audience and recognition, even for his homemade short films She and Her Cat (1999) and Voices of a Distant Star (2002). “As a child, I never dreamed of becoming an anime director,” Shinkai told NHK World. “When I had to look for a job, I had no idea what to do and tried finding work at many different companies. The only one that wanted to hire me was a game company (Minori, which specialised in Visual Novel games). There’s a close continuity between Shinkai’s work for Minori and his later anime. His cinematic intro for the game ef – the first tale has many Shinkai hallmarks, down to its lushly lambent palette and the framing of figures in backgrounds that look both realistic and celestial. ef was later remade as an anime by the hyper-stylised Shaft studio; how different it would have been as a Shinkai anime! 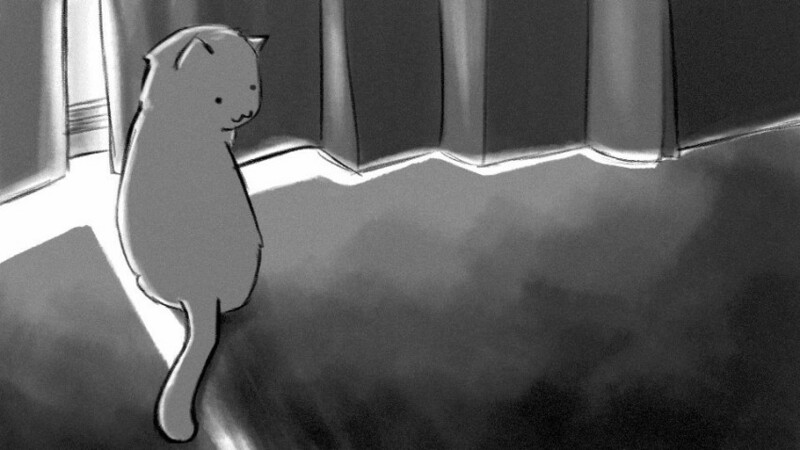 It was while Shinkai was at Minori that he made his first two shorts: Other Worlds (1999), a 90-second piece, and the better-known She and Her Cat. Both films are about couples – a boyfriend and girlfriend, a woman and her cat – and the implicit distances between them even when they look intimate. Shinkai has pondered such distances ever since in his work, and how they reflect the state of the world. He left Minori to make his next anime, the 25-minute long Voices of a Distant Star. At the start, its heroine reflects how she used to think “the world” meant anywhere where her mobile phone signals would reach. These are the metaphysics of a teenager born into the new century, which was just two years old when Voices was released. 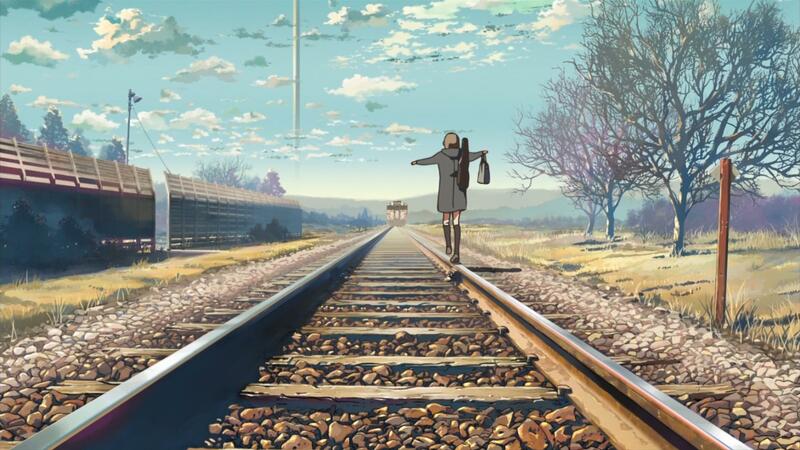 In the film, the girl defends humanity, piloting a giant robot into space battles set against epic space vistas. But what she cares about is sending texts to her sweetheart back on Earth, sustaining her memories of rain and soil and chalkboard erasers, tiny things in the face of infinity. “When I thought of Voices,” Shinkai explained in a DVD interview, “digital hardware and software, the tools for image production, were pretty much at the point where an individual could access them. It was also a period where DVDs, PlayStation 2s, and things like them were spreading.” Shinkai made Voices practically by himself, an enormously inspiring feat for anime fans dreaming of participating in their favourite medium. Those same fans could put Voices in the tradition of Studio Gainax, whose staff began as enthusiastic amateurs in the 1980s. Indeed, Voices has several resemblances to Gainax’s work. Voices went international fast. By 2003, it was available on British and American DVD, released by ADV Films. Two years later, Shinkai was a “name” director like Hideaki Anno or Hayao Miyazaki, presenting his next film at London’s British Film Institute. The film, called The Place Promised in Our Early Days, was Shinkai’s step beyond short, solitary productions to a feature-length film with a full staff. Still, Shinkai still has multiple credits on Place Promised. As well as directing, he wrote and storyboarded the film, was sound director and director of photography, contributed to the background art and produced the Japanese DVD’s booklet. Shinkai’s credits are similarly extensive on his later films. He even adapts his anime into other media personally, writing novelisations of 5 Centimeters, The Garden of Words and Your Name. 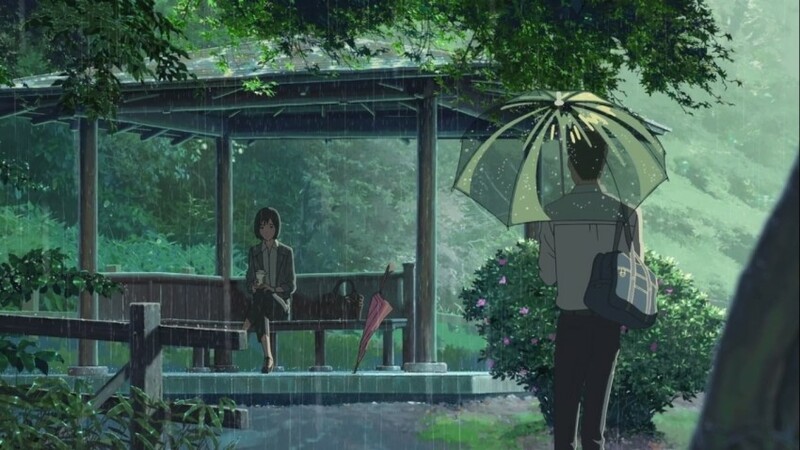 Shinkai uses different collaborators on different films – for example, his newest film Your Name features Masashi Ando, who was animation director on A Letter to Momo and When Marnie Was There. However, Shinkai’s films are all instantly identifiable as Shinkai films, thanks to their colours, framing and hyperrealism. The Garden of Words may look far lusher than Voices a decade earlier, but there’s a clear continuity. As well as the films’ beautiful visuals – created with the resources of the CoMix Wave studio, which has supported Shinkai through his career – his oeuvre is tied together by many motifs. Most obvious are Shinkai’s recurrent themes of human separation and yearning, of uncrossable distances between soulmates. Sometimes these distances can be crossed by a grand romantic gesture; sometimes they’re only crossed by the characters’ emotions, unbound through Shinkai’s magic montages that collapse time and space. He edits mundane scenic images – the signboard on a station platform, or the controls on a domestic washing machine – with the speed and density of an action film by Michael Bay. Shinkai overlays these images with voiceovers by his main characters, which often become poems or duets, while his worlds throw up magnificent metaphors for those characters’ emotions. A space probe hurtles forever into the void; a billion teeming raindrops fertilise a Tokyo park. Shinkai’s career has its own overspills. There are Shinkai films that even fans may have missed, such as a humorous one-minute short (2008) about an eternally stepped-on cat; this was made for the broadcaster NHK as part of an anthology, Ani-kuri. Shinkai had previously made a short for NHK called Egao (2003), showing the world through a hamster’s eyes. A longer film, the seven-minute Someone’s Gaze, was shown at the Tokyo International Forum in 2013. It shows the stresses and strains of modern life from (it’s implied) a feline perspective. You might see it as a kind of companion to She and Her Cat – which itself inspired a TV miniseries this spring by another director, Kayuya Sakamoto. Your Name is screening in cinemas around the UK in November.